By comparison to the athletes in football, baseball or basketball, salaries paid to motorcycle racers is kept pretty hush, hush. The have been estimates of what MotoGP riders make (Marc Marquez and Valentino Rossi are reported to be in the $10 million per year category, with Jorge Lorenzo and Andrea Dovizioso not far behind), but trying to get a handle on what motocross, road race and flat track riders here in American make is a very well-guarded secret. 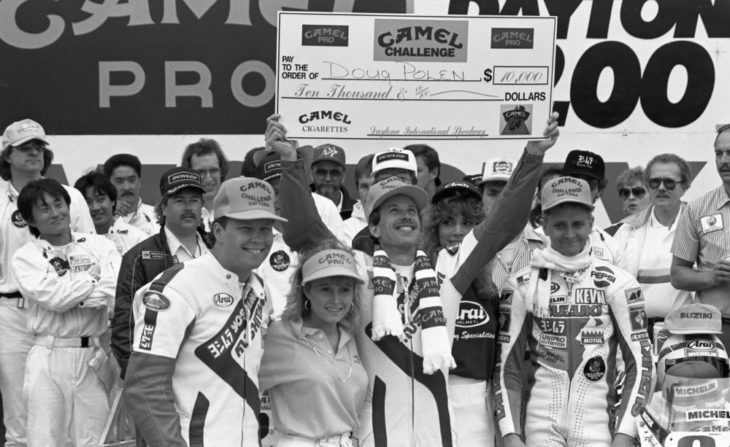 Tobacco money propped up earnings for pro motorcycle racers from the 1970s to the early 1990s. Fortunately, some riders have talked to me about how much they made during their careers and what they know fellow riders made. And I have several other contacts in the industry who have given me ballpark figures and when I get similar figures from different sources it gives you at least an idea of what kind of salaries are available. On the very top end are the elite MotoGP who can crossover and earn big bucks for mainstream product endorsement deals. In America those mainstream endorsements are few and far between, but they do happen on occasion. Remember in the mid-1990s and Jeremy McGrath with 1-800-Collect, or more recently Travis Pastrana for Dodge? The money for MotoGP riders hasn’t seen the precipitous drop that riders suffered here in America. Mainly because multiple factories are competing for the very best talent and they have to pay accordingly. But also, because outside-the-industry sponsorship is still around at that level, i.e. Repsol (a Spanish oil company), MoviStar (a major telecommunications brand owned by Telefónica), Pramac (an Italian maker of commercial lighting and generators), Tissot (a Swiss watch maker), Singha (a Thai beer maker), BMW, Michelin, DHL and so on. Even the lower-tier riders in MotoGP are making decent money, say in the $250,000 range, so if you are good enough to be in motorcycle racing’s top series you will be paid. I was surprised to learn that even a few of the leading Moto2 riders have contracts approaching a million per year! The top-tier World Superbike riders can make well into the hundreds of thousands, but no one I talked to thought there were any riders in that series making north of a million. In America it still pays to be one of the elite motocross or road racers, but the numbers are still way down compared to pre-recession numbers. At its peak riders like Mat Mladin, Ricky Carmichael, James Stewart, Ben Spies and Miguel Duhamel were in the million dollar per year-plus category. Insiders say Mladin was at one time the highest paid motorcycle racer in America, rumored to be making 4 million per year! And beside the money they earned from salaries, endorsements and purse money, some of the perks were pretty amazing. When Kevin Windham raced factory Honda in the mid-2000s, his contract called for him to be flown to and from the races on chartered planes. He would often sleep in his own bed the night of a national, allowing for an extra day of training while most spent a full day in airports travelling commercial. The top Supercross and motocross riders can still make a million-plus annually with endorsements and purse money (Tomac just added substantially to his income with his controversial win of the Monster Million at the Monster Energy Cup), but they work hard for the money with essentially a year-round season, with only a precious few months off in early winter. Motocross salaries have not suffered as drastic of a downturn as has been experienced in road racing. The main reason is there are still multiple factory and factory-support teams in the championships. In the 1970s the biggest money to be made in motorcycle racing domestically was in the AMA Grand National Championship. Tobacco money bolster the pay and riders earned huge bonuses. Things went off the rails quickly though after tobacco money left in the mid-1990s, but In American Flat Track today things are looking up for riders with the competition between Indian and Harley-Davidson. Pay is still lagging behind other championships, but with Kawasaki and KTM rumored to coming into the series with factory-backed efforts, flat track could once again be a good place to make a living. In road racing here, the money rides are precious few. You essentially have four factory seats in MotoAmerica Superbike with Yamaha and Suzuki. Both companies also have support squads, but rumors in the paddock are that at least Yamaha is going to pull back some of its support in Superpsort racing. The top paid riders in MotoAmerica are Cameron Beaubier and Toni Elias. Best guestimates are that they are both making in the mid-six figures. Superbike racer Roger Hayden was the last of the riders who raced in the big-money era of road racing in this country. He just retired last month after 20 years of professional racing. But if their money is managed well, and they resist the temptation to spend money on things that are not good investments, today’s top riders can reach that goal of financial security after racing. One leading personal manager told me that he felt four million was a nice goal to shoot for. He said if riders could race long enough and put away that amount of money, even with conservative investments they should be able to live a decent lifestyle the rest of their lives. The change to the new normal in road racing came quickly and caused many riders to retire perhaps before they’d hoped, says four-time AMA Superbike Champion Josh Hayes. Hayden thinks MotoAmerica is making all the right moves. He believes it’s possible that big paydays for more riders could come back into the series.